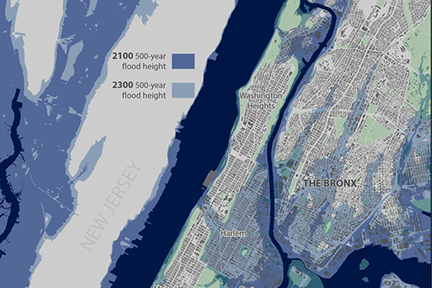 A portion of a map of sea level rise in New York City created by Carolyn Fish based on research by climate scientists, including some from Penn State Meteorology, which was featured on Phys.org as well as a Penn State News story. Carolyn Fish was awarded the Cartographic Perspectives Journal 2016 Student Paper Competition for an article co-authored with Kirby Calvert on solar energy web maps. Pastoralism is livestock production through extensive grazing on open access rangelands. It remains one of the oldest and main production systems in the world and is practiced mostly by semi-nomadic pastoral groups in Cameroon. Though pastoralism contributes immensely to the national revenue, food security, and employment opportunities, its future in the region is very uncertain. The government of Cameroon, like many other African governments, undermines nomadic culture through a land use policy that fails to implement adequate policies to protect pastoralism and foster sustainable agro-pastoral development. In the Western Highlands of Cameroon where this project is based, pastoralism is endangered by population growth and infrastructural development, agricultural expansion, creation of protected areas, climate change, and persistent farmer-herder conflicts between local farming communities and Fulani pastoralists competing over declining agro-pastoral resources. 3:30 to 5:00 p.m.: Refreshments are offered in 319 Walker Building at 3:30 p.m.; the lecture begins in 112 Walker Building at 4:00 p.m.
Penn State University Libraries will celebrate GIS Day on Tuesday, Nov. 14, at an event aimed to the broad audience of the Penn State community — students, staff, faculty and community members — with interests in learning about how geospatial information is being used on campus and beyond. This year’s program, “Visualize the World: GIS, Maps, Drones, Virtual Reality, Location Intelligence,” explores the pervasive nature of geospatial information across new and emerging technologies — including drones and virtual reality — and how the geospatial revolution of interrelated technologies is enabling greater interaction with geospatial information on a daily basis. The extraction of unconventional oil and gas—from shale rocks, tight sand, and coalbed formations—is shifting the geographies of fossil fuel production, with complex consequences. Following Jackson et al.’s (1) natural science survey of the environmental consequences of hydraulic fracturing, this review examines social science literature on unconventional energy. After an overview of the rise of unconventional energy, the review examines energy economics and geopolitics, community mobilization, and state and private regulatory responses. Unconventional energy requires different frames of analysis than conventional energy because of three characteristics: increased drilling density, low-carbon and “clean” energy narratives of natural gas, and distinct ownership and royalty structures. This review points to the need for an interdisciplinary approach to analyzing the resulting dynamic, multilevel web of relationships that implicates land, water, food, and climate. Furthermore, the review highlights how scholarship on unconventional energy informs the broader energy landscape and contested energy futures. Many scientific problems require multiple distinct computational tasks to be executed in order to achieve a desired solution. We introduce the Ensemble Toolkit (EnTK) to address the challenges of scale, diversity and reliability they pose. We describe the design and implementation of EnTK, characterize its performance and integrate it with two distinct exemplar use cases: seismic inversion and adaptive analog ensembles. We perform nine experiments, characterizing EnTK overheads, strong and weak scalability, and the performance of two use case implementations, at scale and on production infrastructures. We show how EnTK meets the following general requirements: (i) implementing dedicated abstractions to support the description and execution of ensemble applications; (ii) support for execution on heterogeneous computing infrastructures; (iii) efficient scalability up to O(104) tasks; and (iv) fault tolerance. We discuss novel computational capabilities that EnTK enables and the scientific advantages arising thereof. We propose EnTK as an important and unique addition to the suite of tools in support of production scientific computing. implications of this water crisis alone are difficult to comprehend, and yet the calamity is even further compounded by climate change and international politics. although glacier response to climate warming is not uniform, thousands of Himalayan glaciers are on track for dramatic retreat or disappearance. • Brian King was interviewed on “The Academic Minute” about food scarcity and the treatment of HIV. In this talk, I suggest that social and cultural geography as a discipline and pedagogical stream needs to pay more detailed attention to the ongoing production of what I call toxic geographies, or emotionally toxic material spaces, for geographers of colour. I use the term “toxic” deliberately. I recognize that the word is a loaded one. Toxicity is often referred to as the degree to which a substance can destroy an organism. In geography, toxicity has sustaining, long-term implications not only for the lives of scholars of colour, but it also impacts the scholarship on race and difference. Geography graduate student Megan Baumann has been spending the last few summers in Nicaragua learning from farmers how they manage their land and crops. As the recipient of a National Science Foundation Graduate Research Fellowship, she hopes to continue her research in this area. 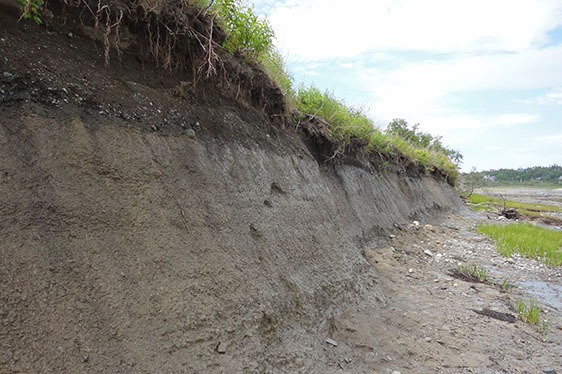 Rising sea levels caused by a warming climate threaten greater future storm damage to New York City, but the paths of stronger future storms may shift offshore, changing the coastal risk for the city, according to a team of climate scientists. On 26 September 2014, Mexican police forces in Iguala, Guerrero, attacked and abducted four dozen students known as normalistas (student teachers); some were killed on the spot and the rest were never seen again. Within and beyond Mexico, rights activists immediately raised the alarm that the normalistas had joined the country’s growing population of “the disappeared,” now numbering more than 28,000 over the last decade. In this article, I draw from a growing scholarship within and beyond critical geography that explores forced disappearance as a set of governing practices that shed insight into contemporary democracies and into struggles for constructing more just worlds. Specifically, I explore how an activist representation of Mexico’s normalistas as “missing students” opens up new political possibilities and spatial strategies for fighting state terror and expanding the Mexican public within a repressive neoliberal and global order. I argue that this activism brings to life a counterpublic as protestors declare that if disappearance is “compatible” with democracy, as it appears to be within Mexico, then disappeared subjects demand new spaces of political action. They demand a countertopography where the disappeared citizens of Mexico make their voices heard. Activists demonstrate such connections as they compose countertopographies for counterpublics across the Americas landscape of mass graves, prisons, and draconian political economies, mostly constructed in the name of democracy and on behalf of securing citizens. Understanding how Mexico’s activists confront the intransigent problems of state terror, spanning from dictatorships to democracies, offers vital insights for struggles against policies for detaining and disappearing peoples there and elsewhere in these neoliberal times. State-level changes in US racial and ethnic diversity, 1980 to 2015: A universal trend? BACKGROUND: Few studies have examined long-term changes in ethnoracial diversity for US states despite the potential social, economic, and political ramifications of such changes at the state level. OBJECTIVE: We describe shifts in diversity magnitude and structure from 1980 through 2015 to determine if states are following a universal upward path. METHODS: Decennial census data for 1980‒2010 and American Community Survey data for 2015 are used to compute entropy index (E) and Simpson index (S) measures of diversity magnitude based on five panethnic populations. A typology characterizes the racial/ethnic structure of states. MGIS students from Rhode Island, New Jersey, Ohio, and New Mexico working on their MGIS capstone projects were invited to participate in an online pub time on October 10, 2017. MGIS faculty (left to right) Justine Blanford, Beth King, and Jim Detwiler gathered after work at Whisker’s pub in The Nittany Lion Inn. They exchanged tips and ideas in an informal setting and connected with their fellow students. 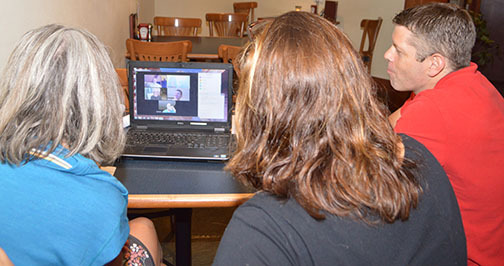 Through Zoom, students shared glimpses of their home life, kids and pets. Another pub/tea time will be announced soon. Gian Rocco was elected Chair of the Amphibian and Reptile Technical Committee (ARTC) of the PA Biological Survey (PABS). Eli Nasr Azadani has been recognized by the North American Association for Environmental Education as one of their “Environmental Education 30 Under 30” for 2017. The program recognizes individuals in the U.S. and internationally, 30 years of age or younger, who are game changers in their communities. Alumnus Tony Greulich (’96) was recently promoted to the position of Planner IV in the Development Review and Design Division of the Department of Planning for Henrico County, Virginia. He credits Roger Downs with setting him on the right career path. Mark Guiltinan and Siela Maximova co-direct a program to study the molecular biology of cacao with the long-term goal of helping cacao farmers develop sustainable farms. Their work spans the gamut of the land grant university mission of research education and extension—from genome sequencing and functional genomics, educational programs for scientists from developing countries to hands-on teaching of farmers in cacao production methods—their program integrates multiple levels of the cacao production system. This talk will give an overview of the research program and focus on a specific program, Cacao for Peace, which aims to help cacao farmers in Colombia in the post-conflict era through integration of the land grant mission strategy. Joshua Inwood joined the Department of Geography in July 2016 as an associate professor and has a joint appointment as a senior research associate with the Rock Ethics Institute. Q: What first inspired your scholarly interests in issues of place, social power, and inequality? JI: I have always been interested in issues of justice and inequality, but it wasn’t until I got into graduate school and I began reading and thinking about social relations and the making of space and place that I realized how the organization of space and place is central to not only understanding inequality, but also how we might address structural inequality. 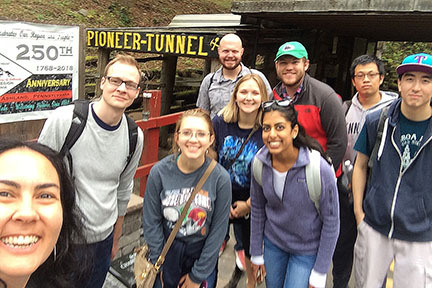 Kimberley Thomas took her GEOG 497 Capitalism, Labor, and the Environment class to tour the Pioneer Tunnel coal mine, in Ashland, Pa., located in the largest anthracite deposit in the world to learn about the working lives of miners. Guido Cervone has been named to the Board on Behavioral, Cognitive, and Sensory Sciences at National Academy of Sciences. The board is engaged in the first ever decadal survey of the social and behavioral sciences, at the request of the Office of the Director of National Intelligence. The committee conducting the decadal survey has the broad task of identifying future research opportunities likely to contribute to the intelligence community’s analytic responsibilities. As part of its information-gathering, the committee will hold a workshop on October 11, in Washington, D.C. on Leveraging Advances in Social Network Thinking for National Security, which will explore how network thinking will evolve and transform the intelligence community in the next ten years. Three online geospatial program students received United States Geospatial Intelligence Foundation (USGIF) scholarships: Roxanne Ahmadi, Jace Ebben, and Travis Meyer. All three are enrolled in the Geospatial Intelligence option of the Masters of Professional Studies in Homeland Security. Cancer is the second leading cause of death in the United States, claiming over half a million lives annually and accounting for 22% of all deaths. Age-adjusted cancer mortality rates have dropped by a quarter from their 1991 peak, despite a wide perception that little progress has been made. Perhaps this is because we have gained relatively little new insight about what factors trigger cancer in the first place. There is a widespread belief – even a collective wish – that mapping cancer at a fine geographic scale will yield these insights. In this talk, I will describe my efforts over the past two decades to tackle this problem. Donna Peuquet, professor of geography at Penn State since 1986, announced her retirement to emeritus status at the end of June 2017. Within the Department of Geography, Peuquet taught many undergraduate and graduate courses, advised graduate students, and served as the undergraduate program director and as the associate director of the GeoVISTA Center. “Dr. Peuquet advanced my thinking and influenced my career by expecting me to learn, think and work as an independent scholar,” 4said Elizabeth Wentz (’97g), dean of social sciences in the College of Liberal Arts and Sciences at Arizona State University. Megan Baumann and Eden Kinkaid are among the new fellows. The Graduate School at Penn State is pleased to host 15 new National Science Foundation (NSF) Graduate Research Fellowship Program (GRFP) award recipients for the 2017-18 academic year. Flooding in Texas and again in Louisiana, a category 5 hurricane in the Atlantic hammering Caribbean islands and Florida and, of course, memories of Sandy and Katrina place extreme weather events like hurricanes and the flooding, storm surge and winds that accompany them in the minds of people in the storms’ paths, but also forefront in the minds of administrators, first responders, government officials and city planners. “Managing Risk in a Changing Climate,” a documentary produced by Penn State’s public television station WPSU in partnership with the Network for Sustainable Climate Risk Management (SCRIM), focuses on Louisiana and New Orleans and their efforts to create a master plan for future events. 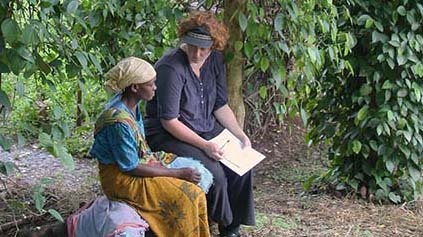 Bronwen Powell discusses dietary diversity and life in general with friend and research participant, Zaina Housseni, in the East Usambara Mountains, Tanzania in 2012. Photo: Keith Powell. Read more about Powell’s research in her faculty profile below. Carolyn Fish received the Geospatial Intelligence Foundation Doctoral Scholarship. Alumnus John Ingram (’71) is running for mayor of Allentown, the third largest city in Pennsylvania. Laura Clemente-Harding’s daughter, Lana Dorothy Virginia Harding, was born on September 29. The sociologists have it right. The average American, lacking access to the American Dream is tired of sharing the fragile benefits of a weakened economy. From the 1970s onward, American manufacturing jobs experienced a steady decline in numbers being replaced by ever cheaper imports. New jobs called for different skills and too often no skill. Shunted aside, American workers faced few opportunities to regain employment in jobs paying a living wage. Changes in public policy— taxation, trade, and labor market regulation— further contributed to economic insecurity. In the USA, progressive policies hard won during past eras of political liberalism were susceptible to interest- group influence that shaped and reshaped the direction of government practices. The 1970s were an economic watershed. The combined forces of globalization and the consequences of technological change transformed the economies of countries around the world and the local communities within them. Jennifer Baka, assistant professor in the department of geography, has been at Penn State for a little more than a year but she has a lifetime of experience assessing the implications of energy. She grew up in a coal mining region of Northeastern Pennsylvania, and watching the relationship a rural community has with a global enterprise factored into her choice to become an energy geographer. It’s a field that combines political and industrial ecology to look at how energy projects impact all segments of society. Bronwen Powell joined Penn State in January 2016 as an assistant professor of geography and African studies. She joined Penn State after nearly four years as a postdoctoral researcher with the Center for International Forestry Research. Powell has spent a large portion of her career living and working in Africa, where she examines the social, cultural, and environmental determinants of human diet and nutrition. When most people think of geographic information systems (GIS), they think of maps. That’s not necessarily wrong; it’s just incomplete. My professional background demonstrates many commercial applications of GIS. Individuals using current technology also apply GIS in a number of ways on a daily or momentary basis: GIS is represented in the navigation on our phones; it largely powers our cars’ computers (and the future of autonomous driving); it helps us search for that best vacation spot; it even assists us with recommendations through our Facebook profiles. GIS is now a fundamental component of everyday life decisions, whether we notice it or not. GIS will inevitably become even more intimately involved in decision making and confer many benefits for individuals. Today’s workforce environments are steadily becoming more distributed across the globe, calling for improved ways of facilitating collaborations at a distance, including geo-collaborations or collaborations at critical locations. Newer technology is allowing distributed teams to move away from traditional conference rooms, taking collaborations into the field and giving remote teams more information about the environment. This idea of situating a remote collaborator’s experiences in the field, virtually, promises to enhance the understanding of geographically remote spaces. Newer technologies in virtual reality (VR) hold promise for providing mobile spatial experiences in real-time, without being tied to fixed hardware, such as systems in conference rooms. An exploratory study using VR technology on remote user experiences in a collaboration was conducted to identify the added value for remote collaborators. The findings suggest immersive capabilities improve feelings of presence in the remote locations and perceptions of being in the remote location increase feelings of team membership.